The newest offering from Blacksmith Games, who have previously brought Plushed [99¢/Lite] and Boostball [99¢] to the App Store, is a physics puzzler called Floop [99¢]. In Floop, the goal is to launch an acorn into a squirrel’s mouth using the least amount of tries as possible. 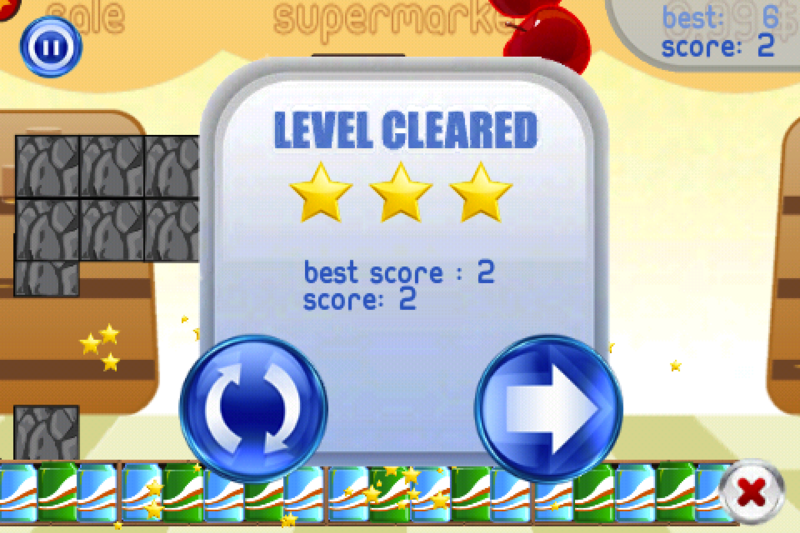 Making this task more difficult are the many hazards and obstacles contained in the 50 cleverly designed levels. Floop is a game that seems so simplistic on the outside but contains quite a bit of complexity, mostly due to the interesting physics engine, and is wrapped up in the kind of visually pleasing package that we would expect from Blacksmith Games. The mechanics in Floop are really easy to grasp. 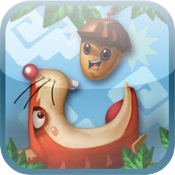 Each level begins with your acorn sitting at one spot in the level and a squirrel with a gaping maw at another. Touching the acorn and dragging away from it brings up a line that shows the trajectory the acorn will travel. Once you’re satisfied with where the line is pointing, letting your finger off the screen sends the acorn flying. 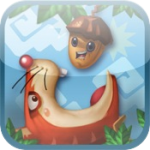 You’ll earn up to 3 stars on each level based on the amount of launches it takes to get the acorn into the squirrel’s hungry mouth. The 50 levels are divided across 4 different themes, with your total amount of launches for each theme tracked through Game Center leaderboards. 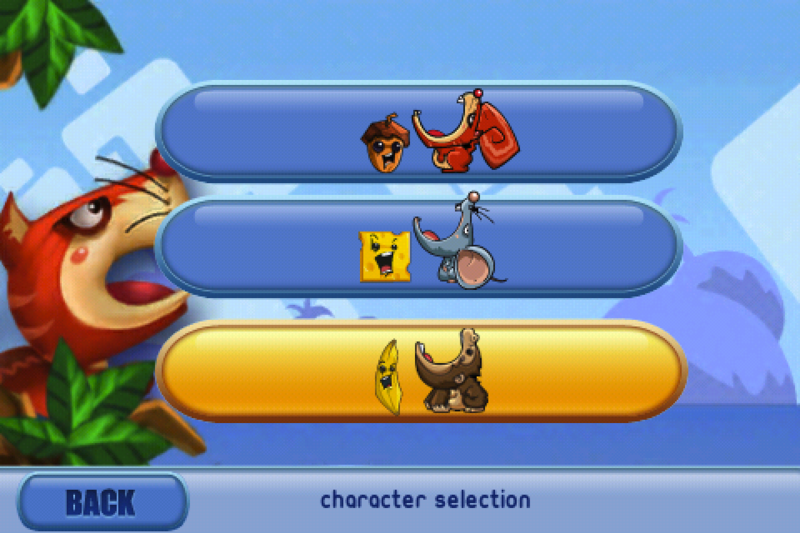 As you collect stars, you’ll be able to spend them on unlocking two additional creatures to use in the game. One is a mouse which replaces the acorn with a block of cheese, and the other is an ape with a banana. Part of what makes Floop so much fun is the different behavior of each of these objects. The acorn has an odd shape and is bottom heavy, making for some crazy bounces. The block of cheese is a perfect square, with nice flat sides that can be used to your advantage. The banana has the weirdest shape of all, as it’s elongated and can bounce in ways you would never expect, kind of like a football. These factors add some variety to the simplistic core gameplay of Floop. In addition to the 3 stars, each level also tracks what object you’ve used to complete it which adds a lot of replayability. The physics system in Floop will either strike you as being fun or frustrating. It’s extremely floaty and unpredictable, which ensures that each attempt at completing a level feels different from one another, but it can also be annoying at times. 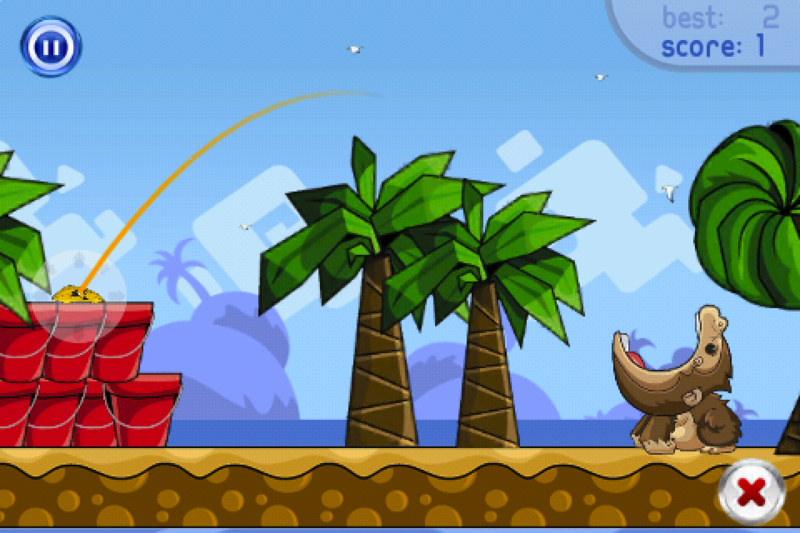 Sometimes it can take many retries just to get past a certain level, and others you will beat just with one launch because you had an incredibly lucky bounce right into the creature’s mouth. Overall I think the random nature of the physics is fine, but will most likely bother you at some point. Also, the touch recognition when trying to launch can sometimes be unresponsive, and there are areas in each level where your object can get stuck, forcing you to restart. These are pretty minor complaints though, and for the most part Floop really is a lot of fun. The Game Center integration with leaderboards and achievements had me hooked on trying to complete each level with the least amount of launches as possible. The graphics are cute and colorful, though unfortunately not enhanced for Retina Display devices, and I really like the assortment of animals that bring different elements to the gameplay. Floop starts out fairly easy, but the difficulty ramps up nicely and it’s quite challenging to complete the later stages, let alone getting 3 stars on them. Players in our forums are really enjoying the game as well, and I would recommend Floop if you’re in the market for a new physics puzzler with a slightly unpredictable nature and a good amount of content.